Channel a Mythic Cowboy who sings, and you can embody more Cowboy facts. 31. Cowboys get cool nicknames like Tex, Red, Ringo Kid, Cattle Queen, Bucko, or Roy Rogers–although I think Leonard Franklin Slye has a nice ring. 30. Cowboys burst into Song. Mythic song. And often. Try it next time you are in a traffic jam, a crowded subway car, a wide-open wheat field, or a kiddie pool. 28. Cowboys get to ride horses, which they somehow have learned to ride perfectly, without having to go through the tedium of getting bit, stepped on, scraped off the saddle in the rub-against-a-tree trick, or get flipped off and dragged, dangling from one stirrup for several rocky, muddy, and terrifying moments before the stirrup’s buckle slipped off (true story). 27. Cowboys get Sidekicks, so you will always be accompanied by someone who thinks whatever you do is amazing, gets you out of scrapes, and makes you look handsome. 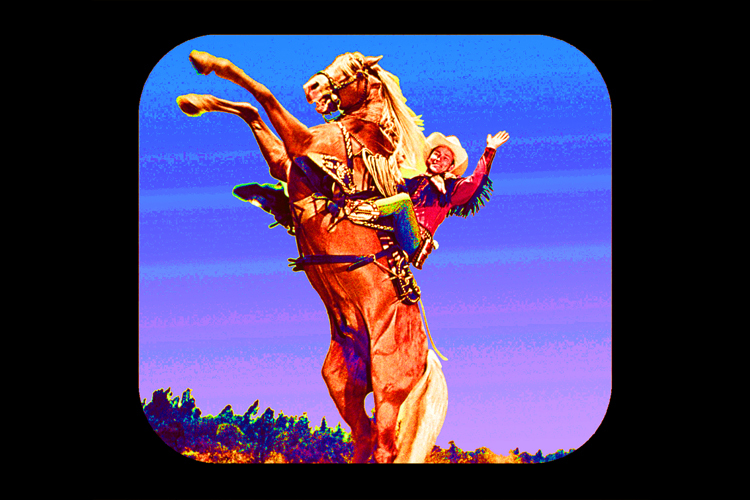 Happy virtual trails to you, Roy Rogers! May we all embody the Roy Rogers Club Rules. Or at least some of them. I think I got 3 out of 9. sigh. I will never be a roy rogers cowboy. I think he holds up an impossible task, but that is the next blog posting, methinks….